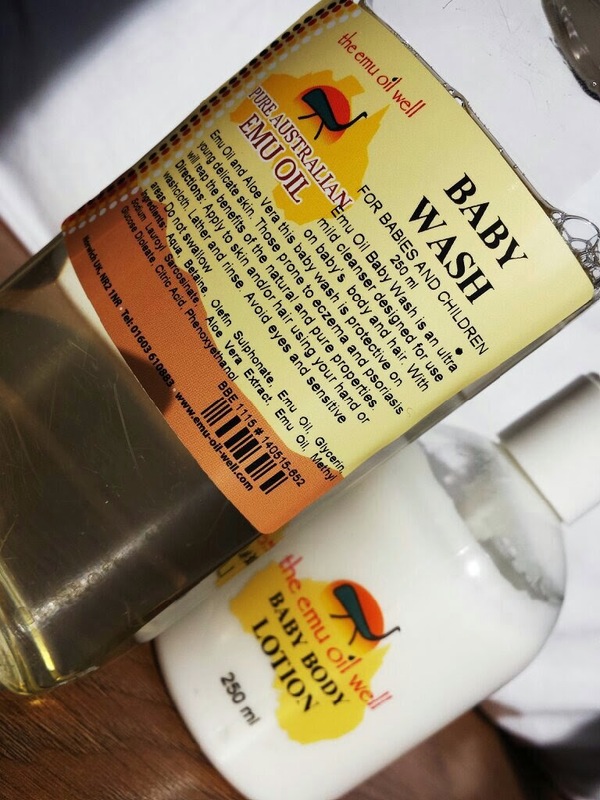 The Emu Oil Well Baby Wash and Baby Body Lotion are two parts to the baby skincare range by the brand. 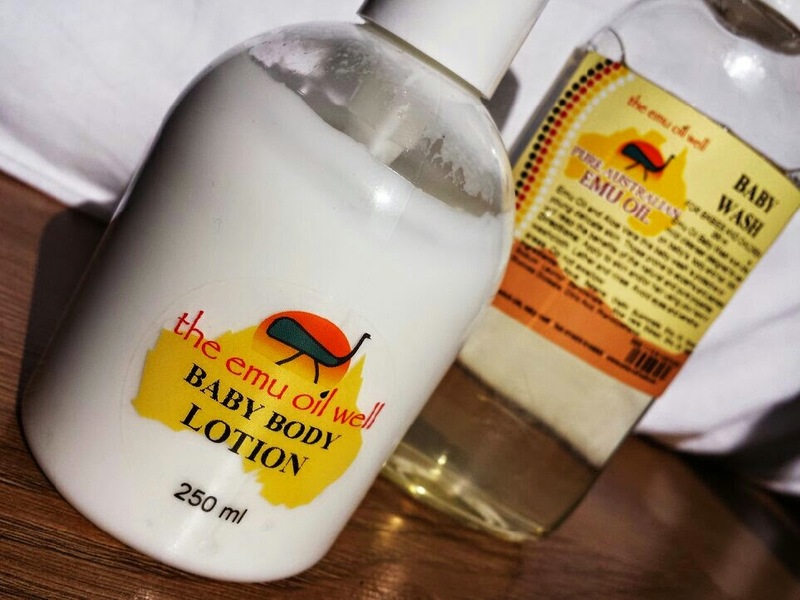 "Emu Oil is a naturally healing oil and is a white solid which melts between 18-22C becoming a pale golden liquid. Most people use Emu oil for muscle and joint problems and for nourishing and repairing damaged skin. Many people also use it for regenerating the scalp and hair. Emu Oil can be used by people of all ages from the youngest to the most elderly. It is gentle enough to use on the most sensitive skin on a daily basis. Emu Oil is non-allergenic. It has been used by millions of people for many decades and no problems arising from its use have been reported." 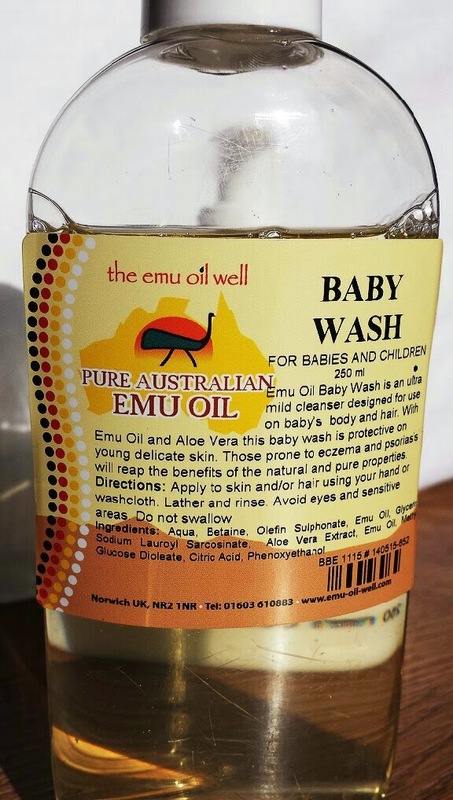 The Emu Oil Well Baby Wash is a gentle formulation that contains Emu Oil, Aloe Vera and Glycerin that not only helps to cleanse your baby, but it leaves them feeling soft and moisturised too. It is designed for use on both skin and hair. After looking at the ingredients list, you may spot the ingredient ‘sodium lauroyl sarcosinate.’ This is not the same as sodium lauryl sulfate, even though they share the same initials - SLS. For more information about it, check out this website here. It is paraben free, too, and even though it isn’t mentioned on the website or the bottle, it seems to be fragrance and colouring free as well. It comes packaged in a clear, plastic squeezy bottle that has a label on the front with all product information. The wash itself is a golden shade and the bottle contains 250ml of the product. The consistency of this body wash is quite watery, but it’s thick enough to not over dispense it as long as you keep in mind that you shouldn’t tip it too far. You really don’t need much, especially when you take into consideration that you are using it on a baby. It lathers up really well and the watery texture also helps it to cover more surface area. One thing that isn’t mentioned on either the bottle or the website is whether or not the formula is tear free. I understand that this may be off-putting for some people, but it is incredibly gentle. It does state though to avoid eyes and sensitive areas, but this would still be stated even if it were advertised as tear free. I really love this body wash. My little man’s skin gets on so well with it. It is incredibly gentle and lathers up really easily and very well. Most importantly though, it doesn’t cause any irritation. It cleans well and also leaves the skin slightly moisturised, but I’d still recommend following it up with a moisturiser. It also leaves his hair soft and shiny and easy to brush. I don’t end up fighting any knots after using it, and he has rather curly hair that is knot prone! I highly recommend this, especially if you are on the lookout for a natural body wash for your little one. My little man is prone to eczema, but ever since switching to natural skincare he hasn’t had a flare up. The only time he has is when we tried him out again on a different, non-natural, popular body wash (that I won’t name because it is a good wash, but it just doesn’t work so well for my son). This is one of the few that I have tried out and I do rate it highly. 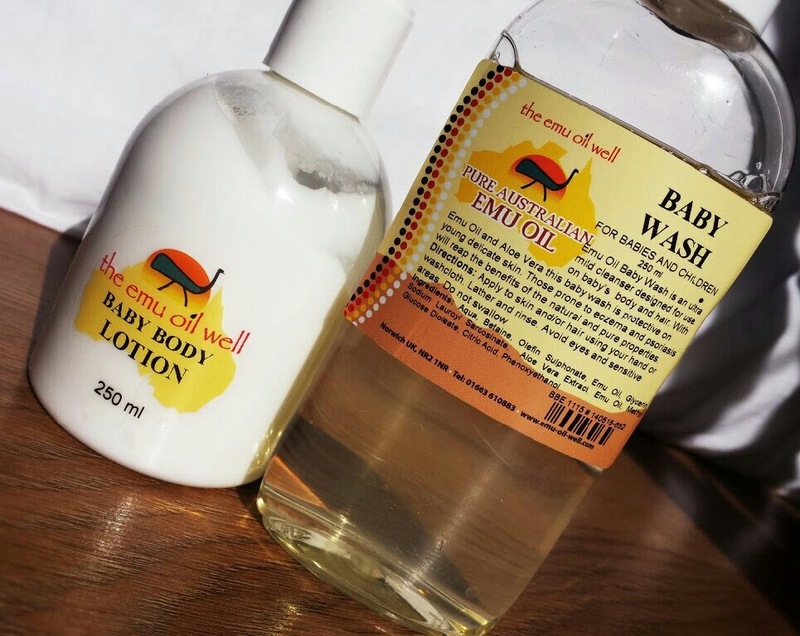 The Body Moisturiser for babies by The Emu Oil Well is a gentle lotion that contains not only Emu Oil, but Vitamin E, Olive Oil and Glycerine that all help to prevent dry skin. It also contains Aloe Vera which is really soothing if the skin has any rashes or allergies. It doesn’t contain SLS, parabens or harsh petro-chemicals and it also comes free of fragrance and colouring. This means that it is suitable for even sensitive skin. The moisturiser comes packaged in a clear, circular bottle with a pump lid that hold 250ml of product. 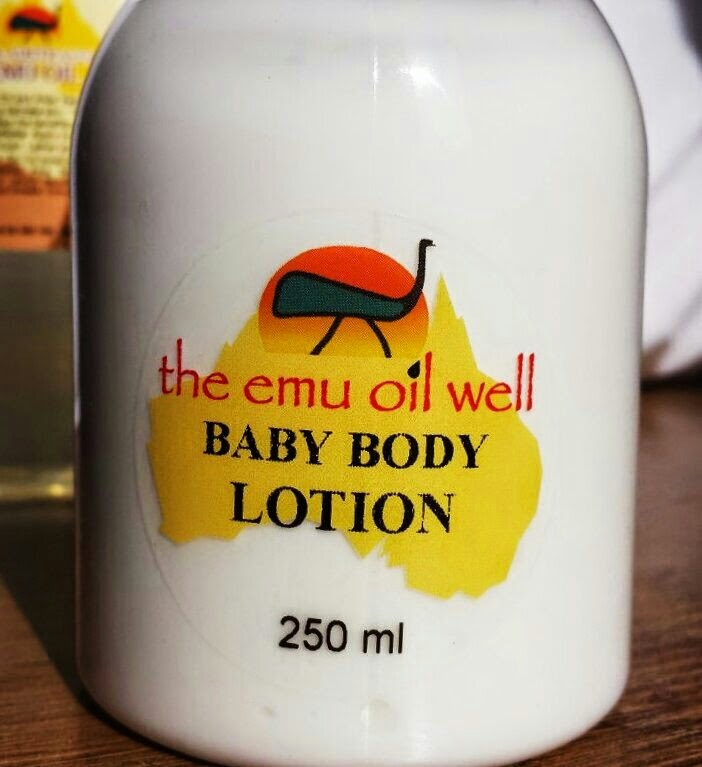 It has a simple Emu Oil Well sticker on the front with the product info. 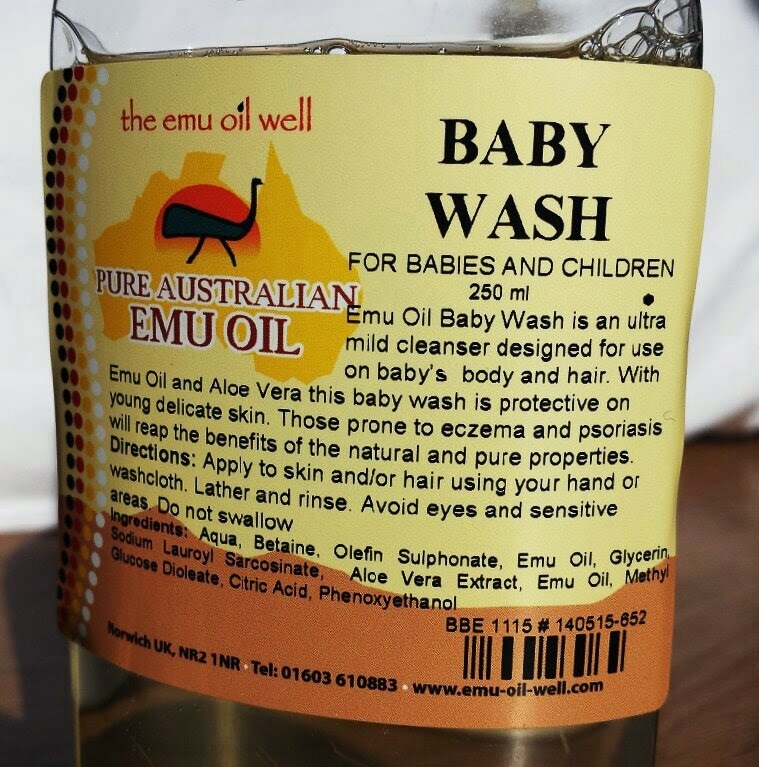 The Emu Oil Well website actually shows a picture of a bottle that is different to the one both shown on and received from Feel Unique, which is where I purchased mine from. Along with that, the product description on Feel Unique seems to be mixed up with the adult version of the moisturiser. It states that the baby moisturiser includes Roman Chamomile and Geranium, but it doesn't. I thought that I would mention that because at first glance at the whole situation it can easily look like you may be accidentally ordering the adult moisturiser. The bottle received from Feel Unique has the same bottle design as the adult version, but the sticker does state otherwise. With the product description matching the adult version too it can be easily mistaken, but be assured that it is the baby version! The cream itself is white and has a regular body lotion consistency - not overly thick like a butter, not watery such as L’Occitane’s Shea Butter Ultra Gentle Lotion for Body & Hands. Again, you don’t need much cream to cover your little one’s skin. Along with that, it absorbs pretty quickly and instantly leaves the skin feeling really smooth and nourished. Due to the exclusion of the nasty bits and instead the inclusion of soothing Aloe Vera, the cream even works great on skin that may be prone to eczema. I think that this is a brilliant moisturiser. My little man hasn’t had any skin irritations since using it and his skin has been happy and soft. Due to the fast absorption as well, it means that it is more difficult for him to get his hands covered in it too (which he will then promptly redirect towards his mouth) which is always a huge help! Most of what I love about this though is for the same reasons I love the body wash - it is natural, and that helps majorly in regards to preventing eczema flare ups. I also love the pump lid. It makes it a lot easier and faster to dispense whilst you are drying off your baby! Overall they're both really fantastic products. They are both gentle, work really well and neither are irritating. That makes them both perfect for sensitive skin and most importantly for your baby's skin! Both also come in a lavender version which is the same formula, but containing lavender oil as well. It's perfect if you prefer to wash your children at night as the lavender helps to relax them! If you are interested in purchasing them, you can grab the Baby Wash for £6.25 for 250ml from Feel Unique and the Baby Body Lotion for £6.25 for 250ml, also from Feel Unique. The lavender versions can also be found on Feel Unique. Click here for the Baby Wash and here for the Body Lotion! Have you ever tried any products by Emu Oil Well? What are your favourite baby skincare products?